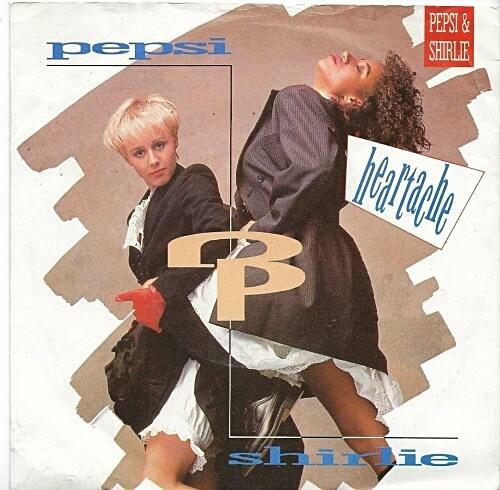 WHATEVER HAPPENED TO PEPSI AND SHIRLIE? Here's an interesting fact. The misspelled term "Pepsi and Shirley" is still searched by around 6,600 people per month in the UK, while "Pepsi and Shirlie" is only searched by 1,900. And that fact gave me a good excuse to use both search terms in one sentence, which should help this page get found in Google, at least! In the video above, you can watch Eamonn Holmes and Ruth Langsford interview the duo on the ITV show This Morning in August 2017. The English pop duo are best remembered for their hits "Heartache" and "Goodbye Stranger", and also for being the backing singers in the 80s pop group Wham!, of course. Helen DeMacque-Crockett (Pepsi) made her first appearance for Wham! in the video for "Wake Me Up Before You Go Go", after replacing Dee C. Lee, who left to join The Style Council - she later married Paul Weller. Shirlie Holliman was a backing vocalist from the start of Wham!, and was Andrew Ridgeley's boyfriend at the time. Shirlie Holliman was a backing vocalist from the start of Wham!, and was Andrew Ridgeley's boyfriend at the time. The duo released their debut single "Heartache" in January 1987, which entered the UK singles chart at No.50 on 11th Jan. The song reached No.2 on 1st February, while George Michael and Aretha Franklin were at No.1 with "I Knew You Were Waiting (For Me)". The Top 2 remained the same for two weeks. "Heartache" was also a top 10 hit in Ireland, Switzerland, Norway, Germany, Netherlands, Belgium and New Zealand. The girls' follow-up single "Goodbye Stranger" was less successful, but still reached No.9 in the UK and No.5 in Ireland and Switzerland. However, despite releasing a further six singles and two albums between 1987 and 1991, the duo failed to achieve any further success with another Top 40 hit. Released later in 1987, their debut album All Right Now stalled at No.67 in the UK album charts, and the second album Change failed to chart anywhere. In chronological order, further singles were "Can't Give Me Love" (#58), "All Right Now (#50), "Hightime" (#79), "What's Going Inside Your Head" (#47), "Who's Gonna Catch You (When You Fall)" (#47), and "Someday" (#46). Chart positions for the UK are shown in brackets. Pepsi and Shirlie's final single "Someday" was produced by George Michael. The pair performed backing vocals on Geri Halliwell's single "Bag It Up" in 2000. During August 2017, the duo performed as part of the Livewire Festival at Headland Arena in Blackpool, to celebrate 35 years of PWL (Pete Waterman Entertainment), which also featured Jason Donovan, Go West, Sam Fox and Brother Beyond. Shirlie married Martin Kemp in St. Lucia during 1988, and the pair remain together. They both took part in an endurance rally during 2018 for the BBC programme Eight Go Rallying: The Road to Saigon. Pepsi ran a gift shop in Wellington, New Zealand for several years, and then briefly lived in Norwich with her husband, Jame Crockett. She is now running a charter sailing business in St. Lucia, West Indies, with her husband James Crockett. Whatever Happened to Strawberry Switchblade? Whatever Happened to Halo James?